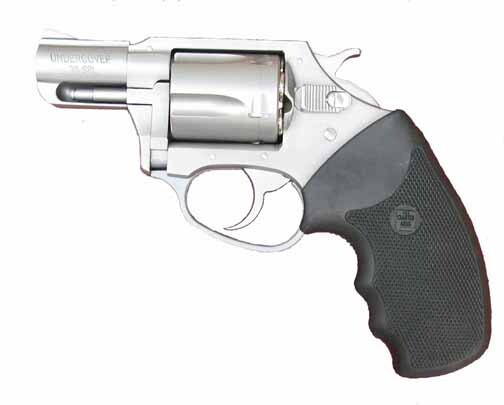 The Undercover is Charter Arms "bread and butter" gun, a 2-inch revolver in .38 Special that handles +P loads. The Undercover is Charter's "bread and butter gun," a two-inch double-action/single-action revolver that sells for less than $400. My sample was the Stainless Steel Standard. It features a one-piece barrel/lug/sight, and the crowned and recessed eight-groove button-rifled barrel seals gasses better for higher velocities and less bullet deformation, which results in increased accuracy. It's rated for +P ammunition, with three-point cylinder lockup and a strong frame. A small retaining screw locks the cylinder yoke in place; it's a setup that will not loosen. Similarly, the solid sideplate is not attached by screws, so it can't shoot loose. The Undercover is not constructed entirely of steel but features a trigger guard and grip frame composed of some type of well-camouflaged polymer. Empty, the Undercover weighs as much as a box of cereals. index finger curls around it for a smooth double-action stroke with approximately 10 pounds of resistance from a coiled hammer spring. There is some stacking as it nears the break point, but it releases cleanly. For precision shots, its excellent single action trigger trips at a very crisp 3.6 pounds. Cylinder indexing and lock up is vice like when the hammer is rolled back. The non contrasting fixed sights are machined from its frame and barrel and consist of a broad .015-inch ramp front and .017-inch square notch rear. This setup makes for fast sight acquisition, and with its ergonomically designed memory grooved grips, the gun points naturally and is a good candidate for point shooting. Revolvers with two-inch barrels have ejector rods with limited travel, and typically they don't eject spent cases efficiently; extra effort is required to jettison them. The Undercover displays this trait, and the hull nearest the frame consistently hangs up and takes work to eject. The best way to initiate a reload is to vigorously shake the revolver while depressing the rod with the support hand thumb. The rod is relatively thin, and slapping it sharply to punch out cases is uncomfortable. The Undercover (top, fitted with aftermarket Crimson Trace grips) is similar in size to the S&W Model 49. The gun is a handful with +P ammo, which is what you'd expect from a short-barreled, lightweight gun. The revolver printed low at 15 yards with the loads I tried, but I used Crimson Trace laser grips on the Undercover for the accuracy test, and they were just the ticket. The Undercover is ideal for experienced shooters, such as police officers looking for a reliable and rugged backup piece, but you must be sure to test ammo to find something that shoots to point of aim. If you can't, you may have to file down the sight or do what I did and put laser grips on it. Smallest average group: Winchester +P JHP 130 gr.—1.2 in. Largest average group: Remington +P JHP 125 gr.—2.7 in. Average of all ammo tested—1.8 in. 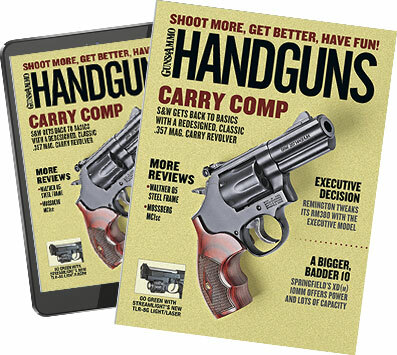 Accuracy results are averages of five five-shot groups at 15 yards from a handheld rest.